Deadly protests in Ethiopia’s regional state of Oromia have left at least 11 students killed, during demonstrations against central government plans to expand the capital Addis Ababa into parts of the region. Violence erupted in several university campuses across Oromia state as ethnic Oromo students protested against Addis Ababa’s annexation. Protesters set fire to a bank, a gas station and some government buildings, say police. Unofficial reports of the number of dead stretch from 20 to 40 according to local media. Oromos are the country’s largest ethnic group with 30 million members, constituting 34.49% of Ethiopia’s population, but are often marginalised in the country’s political, economic and social life. The group fear that the city’s master plan will allow the sprawling metropolis to threaten the cultural, political and linguistic traditions of the state as the local Oromo language is not taught in Addis Ababa schools, devouring rural villages and towns. Protesters claim that the expansion plan will force the eviction of thousands of Oromo farmers from their land without proper compensation. “In addition, the plan would condemn the Oromo, Ethiopia’s single largest ethnic group, to being an agrarian population in a fast-urbanising country and balkanise their homeland into an eastern and western half — in a manner reminiscent of occupied Palestinian territories — leaving the state of Oromia with only nominal control,” wrote Hassen Hussein on Al Jazeera. A spokesman for the Ethiopian government denied the killings and said that the expansion in Addis Ababa was announced long ago and would bring services to remote areas in the Oromo state. The incidents came as US secretary of state John Kerry arrived in Addis Ababa in the first leg of his three-nation trip to Africa “to encourage democratic development”. 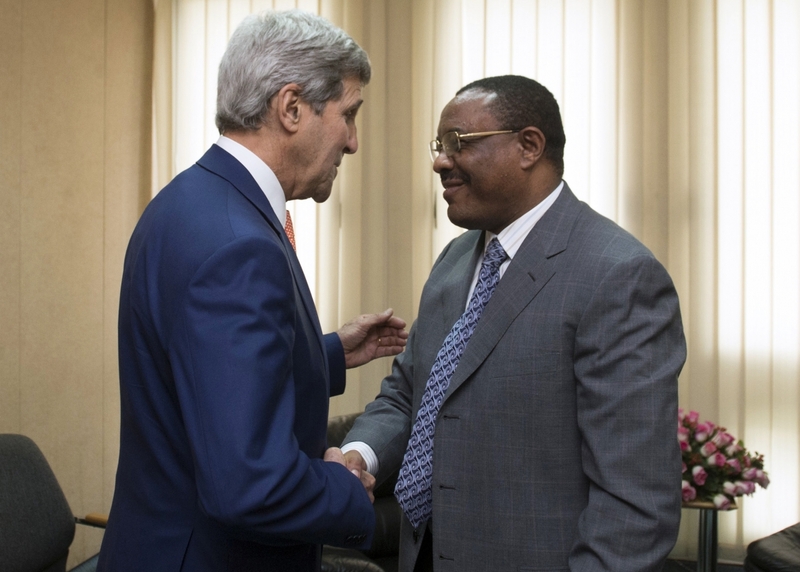 “I made clear to Ethiopian officials that they need to create greater opportunities for citizens to be able to engage with their fellow citizens and with their government by opening up more space for civil society,” Kerry told reporters in Addis Ababa. It is not the first time that Oromo students have protested against the central government. Since 2001, sporadic riots have rattled the state. Posted on May 2, 2014, in Uncategorized and tagged Addis Ababa, Ethiopia. Bookmark the permalink. 1 Comment.